During the last few years, MG and I have seen a growing number of our randonneur brethren adopt generator hubs and connected lights for our night-time events. The trend started taking off in the 1990s when German company Schmidt (a.k.a. Wilfried Schmidt Maschinenbau) came out with their very high quality, low drag SON generator hub. The early adopters in the rando community paired the SON hubs with focused halogen-bulb lights, which were good, but not quite as powerful as higher-power battery systems from NiteRider and others. The tradeoff in unlimited runtime was worth it for them. I held off for a long time on a generator system. On the tandem, where we achieve high speeds on downhills, we need bright lights with a really long throw. I felt battery lights gave us what we needed. At Paris-Brest-Paris with Ixon AA-battery lights. Courtesy Michael Hansmann. The advances in LED technology have changed everything, and this year I started thinking about making the switch. We moved to LED lights a few years ago via the powerful Ixon line of 4xAA-battery LED lights from German company Busch and Müller. Two of these on the handlebars (and a rapid battery recharger in our drop bag) got us through brevets and long randonnees, including Paris-Brest-Paris in 2011. In the last couple of years new LED headlights for hub dynamos began throwing amazingly bright and focused light on the road. Our friends with these lights were outshining us, and giving nary a thought about batteries beyond carrying a backup light. The drag of the latest generation SON hubs with LED lights is so low that they run their lights all the time. Like motorcycle riders, the lighting is bright enough to give daytime drivers notice of a bike on the road instead of blending into the background. Lane and his Supernova light. Courtesy MG.
Schmidt also slimmed down their hubs and came out with an ISO 6-bolt disk brake model. This grabbed my attention because we use disc brakes on our Co-Motion Java tandem. The only holdup was the cost — about $750 for a built wheel (rim, spokes, labor, SON hub), a top-quality B&M or similar headlight and wiring, a tail light and shop labor. 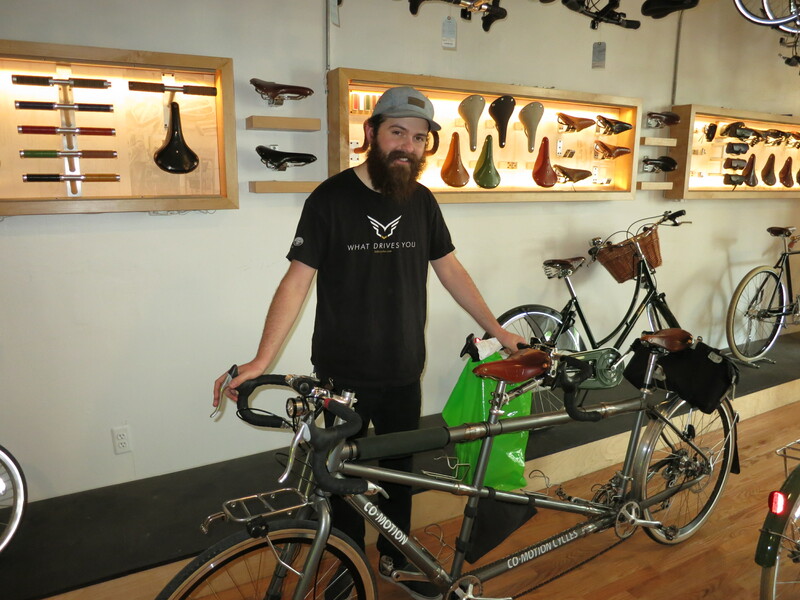 This spring Erik Kugler, co-owner of the BicycleSPACE DC shop in Washington, approached us with an offer. He wanted to build some business for the shop in generator wheels and asked me if I’d buy one at a sale price and write about the experience. Here’s Erik. No lights on this one, yet. Erik didn’t ask me to write a positive review nor ask to see anything in advance. In fact, he has not brought it up since then. This is the first time he or anyone at BicycleSPACE will see the review. So, with that disclaimer, here’s our take on our generator system after 3,075 miles ridden since installation in May. We’ve ridden the wheel exclusively on all our tandem rides and run the light full time. 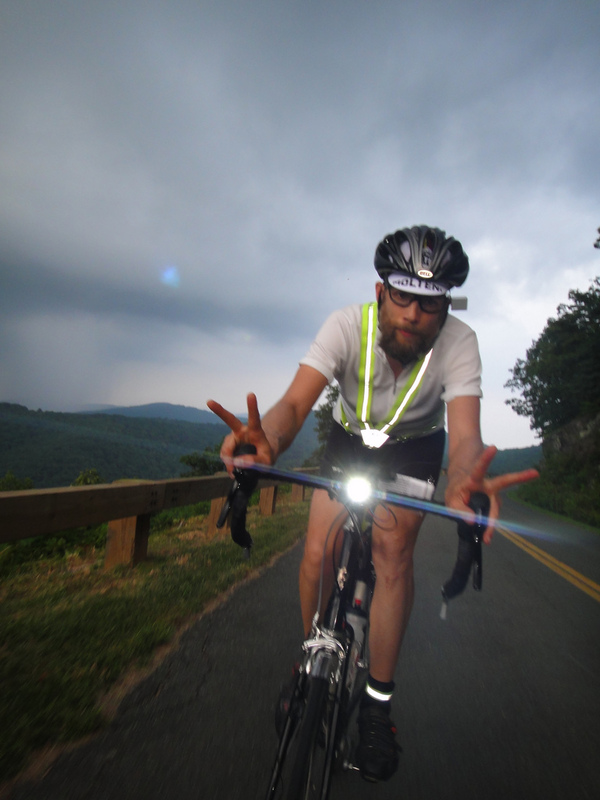 Those include local jaunts such as the Seagull Century, overnight rides to Shepherdstown, W.V., and randonneur brevets in the Shenandoah Valley and Pennsylvania hills. 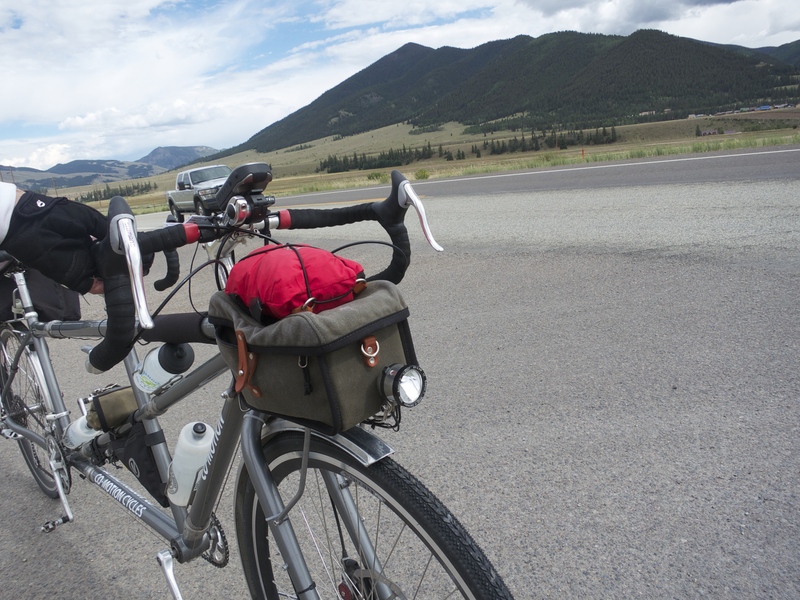 We took it on a 1,000-mile lightly loaded tour of high passes in Colorado in July with some gravel roads, and a 1,000-kilometer hilly randonnee in August, also in the Shenandoah. Edelux II in the fading light to Kremmling, Colo. Courtesy MG. The bottom line: this is a fantastic setup. The lighting is powerful and reliable. We’re converts. First off, I’ll back up and describe our interactions with BicycleSPACE. They were uniformly pleasant and professional. I worked with Tony P. on the sales side at the shop to put the package together. We chose our go-to tandem rim, the workhorse Velocity Chukker, and picked out the parts from Peter White Cycles, the main U.S. distributor of hi-performance German lighting systems. The ever-friendly Tony P. got the order squared away. — front rack and handlebar mounts, wiring and connectors. Schmidt has yet to make a 40-hole tandem disk hub. We’ve been using 36-hole front wheels for years without problems, so that was no setback. The Schmidt 36-hole disk hub, in polished. There was some delay in availability of all the parts, however. It took about a month from our first conversation for everything to arrive at BicycleSPACE and for the building of the wheel to commence. So, if you want the system for the winter darkness, start the process right away, just in case Peter is out of stock on something. But it’s also a great setup all year long — both as a daylight running light and a ready-to-go night light. Tony kept in good contact with me throughout the process and answered all my questions. I felt like he was intent on getting the order right and was happy to confirm everything with me before we proceeded. 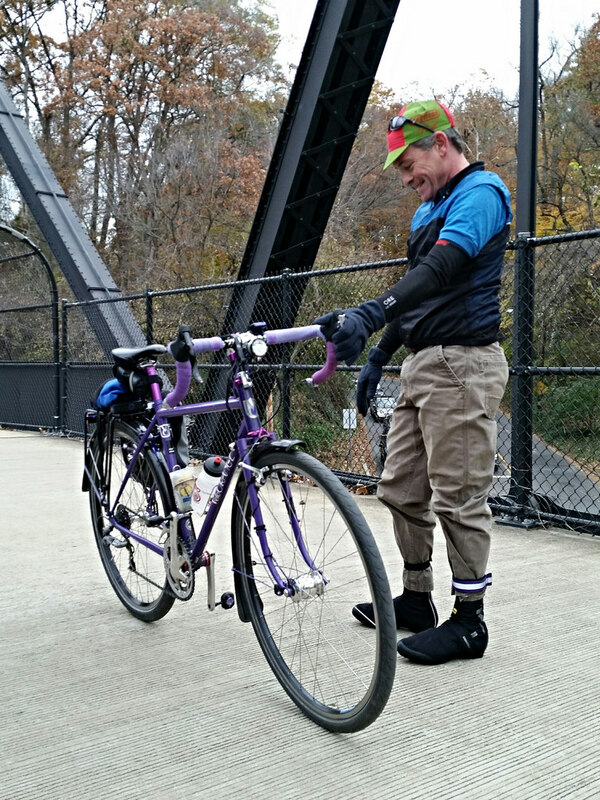 After the parts arrived, veteran mechanic and wheelbuilder Jerry and I had a good talk before he built the wheel. He understood it was for tandem use and that we regularly head for the hills, which puts added stress on wheels. Once the wheel was built we took the tandem to the shop and left it there for fellow mechanic Dave to install everything. 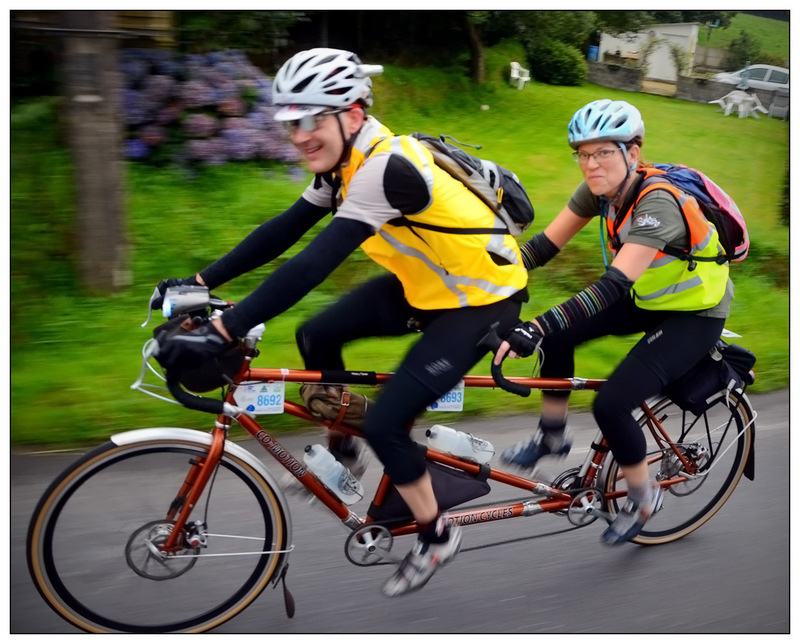 The wiring was the big challenge here, because the tandem is so long. We needed a lot of extra wire, with quick-disconnects added, to reach the taillight while allowing us to separate the frame for airline travel via the built-in couplers. Jerry and Dave. Excellent hands taking a break outside BicycleSPACE. Jerry built a beautiful wheel, straight and strong, and Dave did a clean and thorough job with the wiring. We had him mount the light on a handlebar mount to start. We also wanted to put it on our front rack if needed, and Dave left us enough extra cable from the hub to do either. 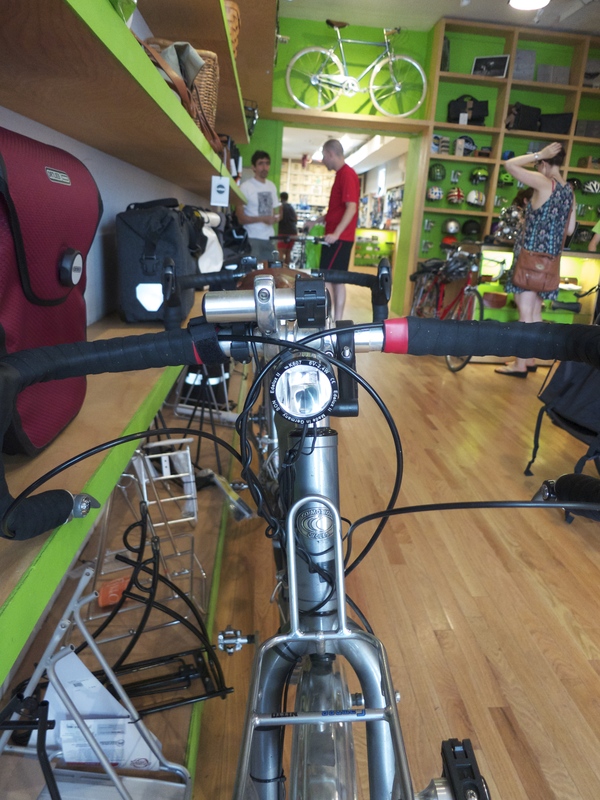 Picking up the bike at BicycleSPACE, a nice clean install. It took me awhile to settle on the right mounting point for the front light. To eliminate shadows from the front bag and front wheel, I moved it to the forward edge of the front rack. I was glad Dave bundled up some extra cable. Mounted the front of our Nitto front rack. There was some vibration from the hub through the fork legs at first when braking. I found that I was not tightening the hub skewer enough. A little extra clamping force eliminated the vibration. In terms of usability, we’re very pleased. Blown away would be more accurate, actually! First off, we don’t sense any penalty in terms of rolling resistance from the hub. I can turn it off at the headlight and there’s no difference in our speed. The Schmidt folks have figured this out, folks. 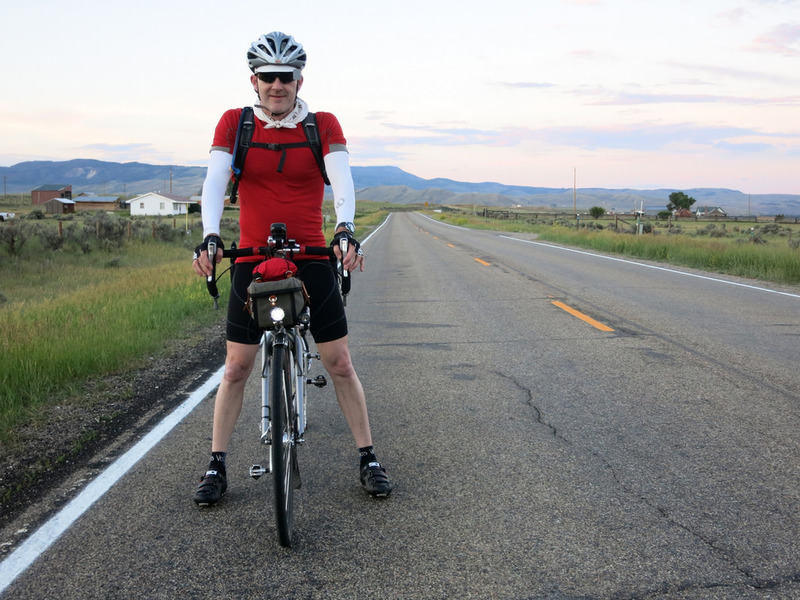 I angled the headlight for a long and wide throw, giving up some near-distance intensity. It delivers a nice even beam that has the feel of the low beam on a car. The Edelux II gets up to full brightness very quickly, and then we have many yards of visibility ahead of us. You can see see what I mean at Peter White’s site, where he compares headlight beams. The one drawback to a light fixed to the bike is that it points straight ahead all the time, which isn’t the best for downhill turns. The Edelux has excellent full road coverage, but obviously can’t see around hard turns. I use a helmet light in the hills at night, which lets me see into the turns until the bike straightens out. In terms of reliability, our system has been excellent. We’ve had no issues, even after disconnecting and reconnecting the cables for our Colorado trip and regularly disconnecting the hub to put the wheel into the car trunk. Both the front and rear lights have been rock-solid in the rain. Lighting the way around our Colorado tour. I won’t kid around: generator lighting isn’t cheap. But you’re getting more than just lighting. You’re getting peace of mind whether on the open road or riding in the city. When we were invited out for dinner in Durango, Colo. by the guys at the bike shop, there was no wondering if our batteries were charged. The lighting front and rear was there at the ready and we just went. During daytime riding I feel like drivers see us more readily. And at night, we have some of the brightest lights on the road. 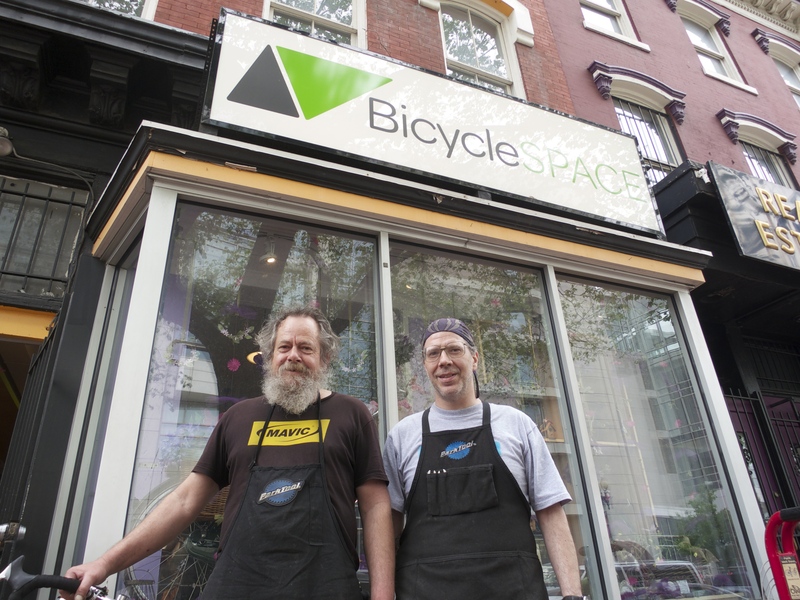 Of course, we have the folks at BicycleSPACE on 7th Street Northwest to thank for making this a painless experience in getting set up. I would have spent hours trying to get the wiring just right and making mistakes. It was money well spent to have Dave complete the installation, and Jerry built us a wheel that has been problem free. If you are on the fence about dynamo lighting, I would say the hub and headlight technology is there now to make the leap. You’ll be glad you did. 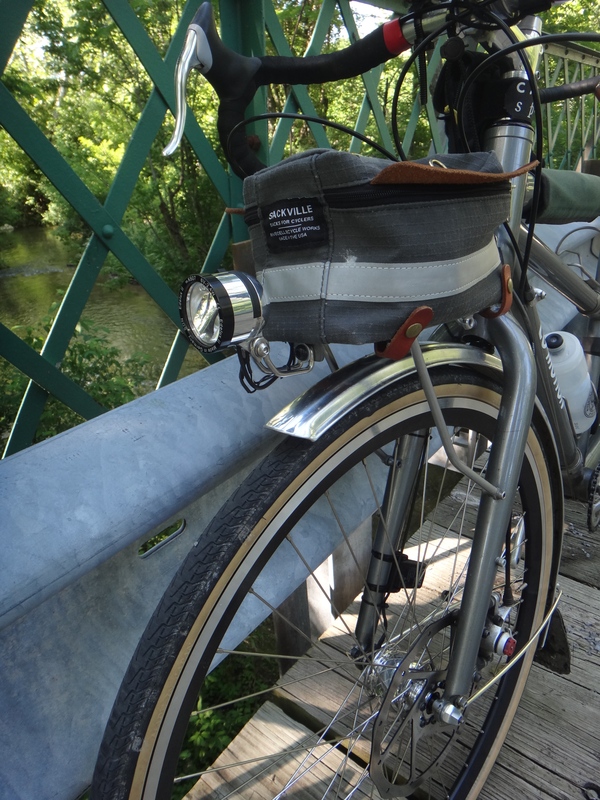 Mike R. with a dynamo setup on his Velo Orange. Courtesy MG. Comments? Please ask questions and I’ll do my best to answer them. Thanks again to Erik and the gang at BicycleSPACE. Very timely post, Ed! I’ve been debating asking Santa for one. Not sure if it makes sense to have my wheel rebuilt with a dyno or start fresh. Did you decide on the Schimdt brand right away or where there other contenders? Any thoughts on the Shutter precision? I’d go with the Schmidt if company reputation and service support matters. It does for us, because we’re going to depend on this wheel for years to come — disk brakes mean no rim wear. For city riding, any dynamo should be adequate. Personally the Shimano offerings seem like a lower-cost alternative with good warranty. Your shop can sort through the economics of new vs. rebuilt. If you need new spokes which I’d think is likely, getting a new build won’t be much more than the cost of a rim and you net a proven backup wheel to use if needed. Nice write-up. If you could post photos of the quick disconnect in the wiring that makes it easy to use S&S couplers, that would be a good resource for people who are doing their own wiring. In the past, I’ve just soldered spade connectors onto the wire, but they can be finnicky to get apart. The build quality is acceptable, but can easily be improved on by anyone who can true a wheel. Just stress-relieve the spokes, retension any that are looser than their neighbors using a “ping” test, and then retrue the wheel. i think the Edelux is a Schmidt light, not Busch and Mueller. I have a Shimano 3N80 hub on my commuter, now with about 3,300 miles on it and I run lights all the time. I don’t perceive extra effort but it’s there. I have the Schmidt SON Deluxe on my road bike. I have only a few hundred miles on it but it seems like less effort (and should be, according to published numbers) and I run lights all of the time for safety, except once on a 17% grade. I feel vibrations from both hubs, skewers properly tightened in both cases. It is evident at 18mph on My Surly/Shimano bike and 28mph on my Indy Fab/Schmidt bike, with the vibration much less pronounced on the Schmidt. I’d love to switch the hubs and see if it is the fork/hub/tire combination but that’s too much work. It’s great that you have the dyno lighting set up for the tandem. Do you think about dyno lighting for your commuting bikes? correct you are, the Edelux II is from Schmidt. Fixed in the review. In my current job I don’t technically commute — my work is 1.5 miles from home. But if I was riding any distance regularly I’d probably get a Shimano hub wheel for cost reasons and a less expensive light. I probably will anyway to set up a single bike for night riding so that I don’t have to think much about battery lights. Regarding the vibrations, I’ve only used our wheel on our disk brake front fork on our Co-Motion, which is pretty beefy. I only felt any vibrations on the first ride at the first couple of stoplights, and none after tightening the skewer; maybe they are unrelated. I ride on a dark bumpy trail through Fairfax on my way to night classes at George Mason U. I was using the Schmidt Edelux I but I found that I had to supplement it with a helmet-mounted Viz 360 from Light and Motion in order to ride at any kind of pace with confidence. I finally bought the Edelux II and have since ditched the helmet light. The Edelux II is shockingly wider than the Edelux 1. I don’t think that the peak brightness is higher, but it covers a lot more area now. There used to be a bright spot in the road 20-30 feet in front of the bike. Now there is a bright swath that covers a really wide section of the trail. I have a Schmidt hub, but a much cheaper Shimano will work just as well and will cut your costs by a lot. On a tandem, I may stick with Schmidt, but for general commuting, there are cheaper options. Finally, the German lights are designed to throw their light onto the road, not into the eyes of oncoming riders, runners and motorists. If you insist on one of those blinding circular-beam-pattern LED lights that seem to be designed for blasting through an un-populated single track, please point it downward, especially if you are on a bike path. Peter White here. Yup, that Peter White. Thanks for the great review Ed. I only have one thing to comment on. There is a close-up photo of the wire attached to the hub. The wire runs straight down the fork blade to the hub, and the 4.8mm male connectors on the hub are pointed straight up the fork blade. Looks like a nice clean connection. However, there is one drawback to routing the wire that way. To connect and disconnect the wires, you need to jam your fingers between the fork blade and the spokes. With this particular fork and hub, it’s not a big problem as the fork blade is offset to the outside, and the right side spoke flange on the hub is a bit further inboard compared with most non-disc versions. This gives you the maximum amount of space between the fork blade and the spokes. But on many forks, and on some versions of the SON hub, you’ll end up with much less space for your fingers. 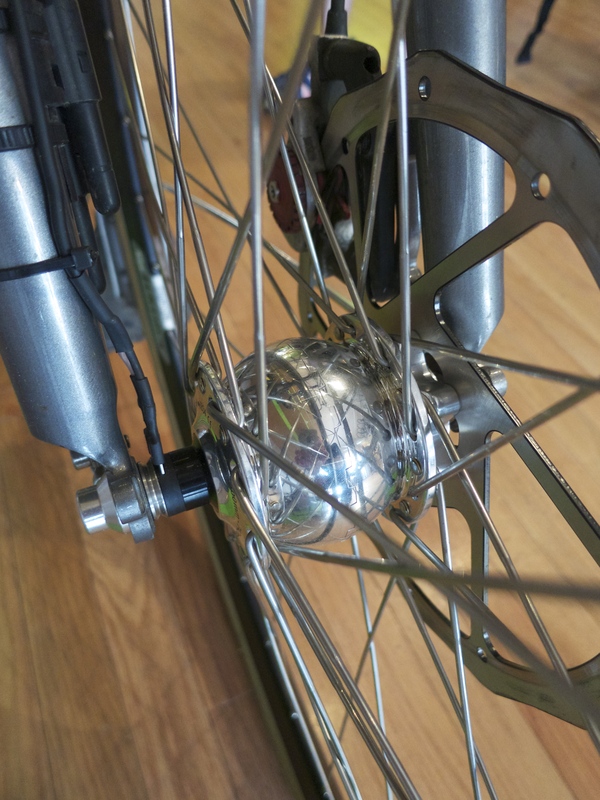 Some SON hub models have wider flange spacing, and most forks position the dropouts centered on the fork blades. For this reason, I like to make the wire about four inches longer than you have it on your tandem. The extra length allows the wire to be attached with the 4.8mm connectors pointed down and towards the rear. The wire runs down the fork blade to about four inches above the hub axle and then loops backwards a bit before coming up to the axle from below. This way you have plenty of space for your fingers to feed the 4.8mm female connectors onto the hub. 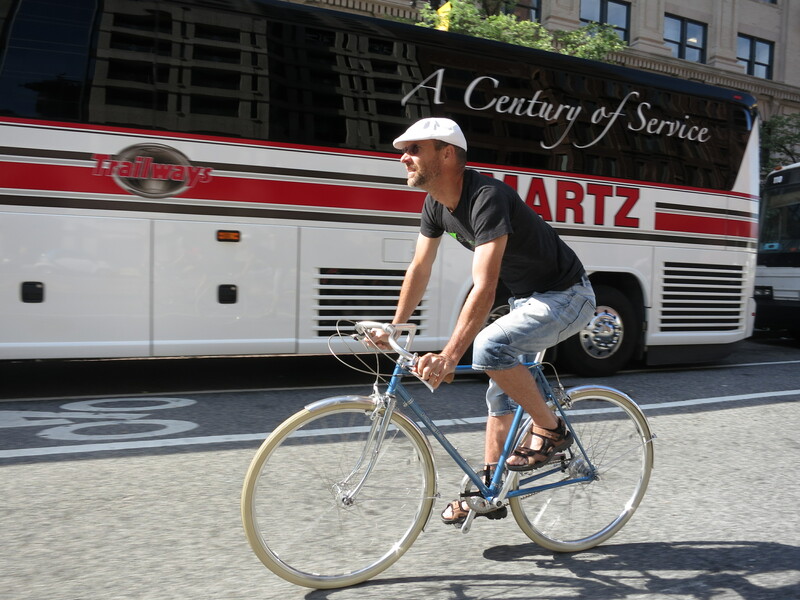 By the way, I’ll be at the Philly Bike Expo again in November. Hope to see you there! Peter, excellent advice. I’ve had a fear of snagging the wire if it is anywhere away from the fork, but this makes sense. We do have the extra length, it’s coiled up near the rack. See you in Philly. Wouldn’t miss it.